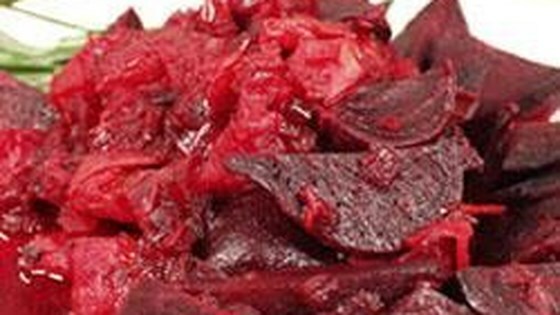 "If you like beets, you'll love this recipe. For those who don't like beets, they may just change their minds." Heat a medium saucepan over medium-high heat. Pour in oil and saute onion and garlic until translucent. Mix in cumin seed and saute an additional 2 minutes. Sprinkle in flour and saute 1 minute more. Stir in beets, tomatoes, water, and salt. Reduce heat to low, cover pan with lid, and allow to simmer 30 to 45 minutes, until beets are tender. Karen - this is a real winner - Beets have always been ugh food in our house. Everyone loved this one. Only change was that we used olive oil. There were NO leftovers. I love beets but hated this version. I had to drain the sauce and then fry them before my husband would eat it. My husband looked at his plate funny when I served him BEETS, of all things, but later he admitted they weren't too bad.